I happily blame my ‘English/French, born in East Africa’ heritage for my peripatetic nature and insatiable thirst for travel! Like a cat I have lived a number of lives – a dancer; politician’s wife; feature writer/journalist; radio presenter (I had the only English-speaking program the island of Crete for five years); freelance photographer/writer; film/TV marketing and publicist; scriptwriter, director and choreographer of children’s theatre and musicals; events co-ordinator; administration manager; Ex-Pat; mother and passionate Grecophile. The one life which has given me the greatest pleasure is living in eastern Crete. The fact that my daughter Alexandra was born on the island could possibly have something to do with it, as well as the never-ending joy of living with that Greek blue! It was here that I literally fell into the world of photography. And who could blame me? After all, Greece is all about the clarity of light, the purity of colour and simplicity of line. I live to breathe Mediterranean air peppered with wild thyme and oregano; swim in azure seas and bathe in that Greek light which has mesmerised so many for so long. To live the simple life of a lotus-eater on an island steeped in aeons of tradition and amongst people with a deep connection to their ancient land, the sea and the air around them. 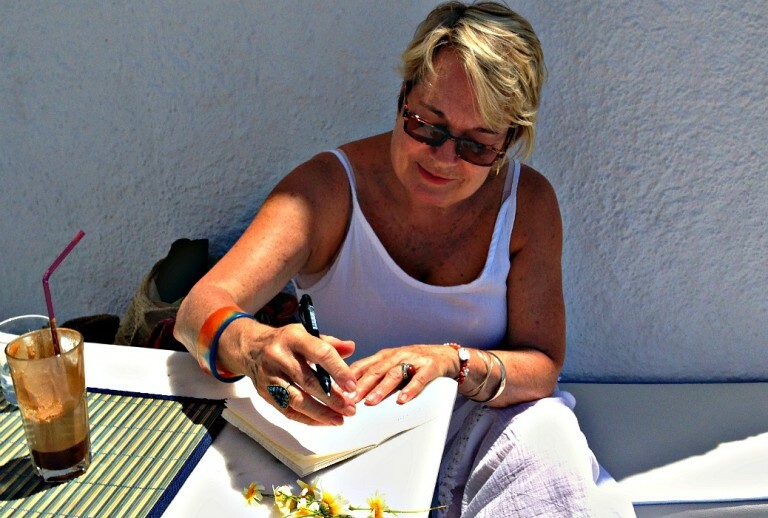 My website and Blog, “That Greek Blue” are where I share my passion and love for all that is Greek, along with the extraordinary I find within the ordinary in my daily life. It’s a reflection of Me and my love of colour, language, food and my spiritual home, Crete. And like a favourite book on the bedside table, I hope you dip in from time to time to excite the senses and ignite a flame within to dream, to travel, to explore, to taste new horizons. So as not to completely confuse you – all Greek words are written phonetically and then in Greek in brackets. Like to learn more about the island I love? Come and see it through my eyes and join me on a small tour to Crete. Fourteen glorious days exploring the history, the food, the culture and beauty of the island. It’s a personal experience which takes you off the beaten tracks where we will learn the secrets of the Cretan Diet by cooking is an old disused olive press high in the mountains; visit traditional working olive farm; lunch under an oak tree in a village which has not changed for centuries and eat Cretan food as the Minoans did 4000 years ago. Contact me for more information on Crete – An Aegean Odyssey in 2019. All words, quotes and images are my own, unless otherwise stated. Please do not copy or duplicate, without my written permission. What a beautiful and engaging website – love the photography and lyrical commentary… looking forward to more. ooh.. fabulous to see your new butterfly emerge.. well done thus far Frannie.. its beautiful.. I’m going to enjoy your writing and pics I just know! Congrats, Fran! Wonderful website, will be sure to follow!? This is beautiful – so many stories take on a journey. Your eye for detail reveals beautiful stories . Will enjoy the armchair journey. Beautiful I couldn’t agree more, I live in Crete in the village of Anopoli near Heraklion! I love your photos! From Ierapetra i met you in Theo house with Jerolyn!! Stunning Francesca I”am going to enjoy your writing and pictures!! the website looks great – congratulations! Hope your Etsy shop goes well, I sell there erratically and it works well for me. Congratulations Fran. Gary & I have visited Greece on many occasions and always find the lifestyle enthralling, albeit frustrating on occasions. Most of our time has been spent on the islands, particularly Mykonos, but also attended a wedding in Athens, preceded by the customary lead up frivolities. Stayed in Kifissia, which is also a delight. Your photographs, your passion for the land & its customs and your style, both personal & literary should ensure that your website will be an outstanding success.